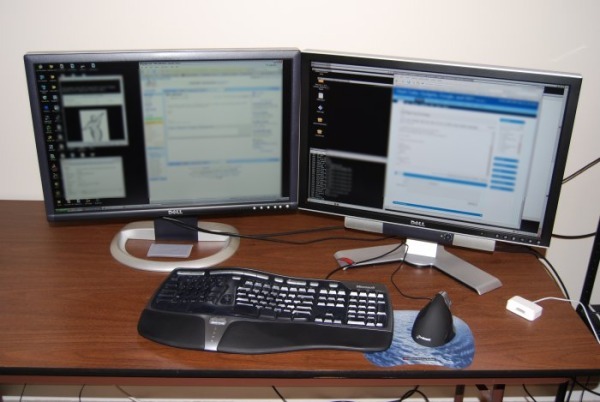 The two left monitors are Windows XP, the right monitor is Ubuntu. From left to right, I have seven browsers open showing my blog, the Google webmaster blog, Techmeme, Friendfeed, Twitter, Google News, and the Google homepage. I love how much screen real estate this setup gives me (a little over 8.7 million pixels). BTW, how much did that 30″ cost you? hey! Matt.. that is a very nice setup. hmmm, two Windows and an Ubuntu.. Would love to know which one is more productive, actually productive.. not from Google or Open source point of view.. I see that 404 post on the screen, Did you open it for this pic. nice to see it anyways. wow! envy on the 30″ monitor! I too have 2 x 24″ monitor (dell 24″ + iMac 24″). How are you liking the 30? I’ve heard some people say they’ve downgraded from a 30 because it just wasn’t efficient…. back in the day I would have been rocking 5 30’s if I could but I’m pretty dang happy with my 24 and even got rid of a couple of 2408 wfp’s just because I didn’t want to have to think about the video card scenario with my mac… I’m thinking about throwing up a second 24 in vertical mode though… the Mahalo guys seem to like that. Nice set up btw ! Those screens are awfully close to the keyboard and mouse; is that really the desk you work at? Nice to have so much screen real estate though! Looking at your set up is a little like seeing the innermost chamber of a wizard. I have thought about doing a double or even triple screen set up, however, because space limitations in my flat, I try to accomplish the same things with one screen using igoogle of course. Hey Matt. Nice setup! I’ll have to splurge on a new monitor soon seeing as the 30″ are coming down in price. Nice to see you’re using the MS Natural Ergonomic Keyboard as well. I’m loving mine since I got it about 12 months ago. Time to upgrade the desk, Matt. I suspect that mat set the monitors up on a table for the shot certainly doesnt look very ergonomic or have much space for working. And you dont want to to make it look to plush or you will get the hacks from vallywag bitching about your setup. Aren’t you worried about people using the “Enhance Button” to read the details on your screen? Nice upgrade. I’m pretty proud of my setup too. I have a WinXP machine with an 24 inch wide main monitor and a 20 inch second monitor. Using synergy, I also connect to a system running either Ubuntu 8.04 or Windows 7 (at the moment) on a 22 inch wide monitor. I also have a second Ubuntu 8.04 box with a 19 inch monitor to the right but that doesn’t get used much anymore. How do you switch btw the ubuntu and the xp? a switchbox? Wicked! Wonder if all these flourescent backlights can cause a bit of of an irritation though. What make is the mouse and keyboard btw? Try rotating one of your 24″ monitors 90 degrees — makes browsing alot different as you can see “beyond the fold” and read alot like a newspaper/magazine. Is it possible to have one keyboard and mouse for the Windows and Linux? Three monitors and two operating systems at once? A fine, but slightly late, April Fool’s gag!. Well done, Mr. Cutts! did no one read his link about Synergy? He uses one keyboard and mouse for both systems with it. It’s very cool. And he linked to it. Brilliant, job at reading, multi-monitor/OS naysayers. He’s using synergy, which is actually linked in the post itself, and in the “related posts” at the bottom. I’m actually considering going from a 24″ + 19″ dual monitor setup to a single 30″ display for simplicity. I find it is too easy to get sidetracked when I have a bunch of windows on separate screens. I had the same thought when I saw this as well. You’re not supposed to use a folding table as a desk. You’re supposed to put professional wrestlers through it….ideally if you dump thumbtacks on it, pour lighter fluid on it, and set it on fire. The 24″-displays have different stands. Geek factor -100. Matt, how does the third monitor (i.e. the two extra browsers) improve your productivity or the quality of your life? You do realize that the monitor might be the single most energy-consuming part of the PC setup, right? I’m sorry to spoil the fun but as an influencer, you should think about the environmental impact, too. I have that same keyboard, but what mouse is that? Hart ~ “Time to upgrade the desk, Matt.” Agreed! Allen, he’s running Synergy. A neat program that allows the mouse and keyboard to interact seamlessly across multiple PC’s of varying operating systems, as though they were all one PC. It’s pretty darn cool! Matt, what sort of mouse is that? Looks funky. You do realize that the monitor might be the single most energy-consuming part of the PC setup, right? Actually, a 30″ LCD probably uses around 130 watts, while the computer itself probably uses at least 300 watts. * Combined wiith the SSD’s, you’ve upgraded the two most important parts of you system. * Thanks for bringing attention to the pixel account. Many people think more inches = more data. * If this makes it to the front of Digg, shoot me. LOL now ime thinking of Matt as a Luche Libra masked wrestler bodyslamming the black hat Heels to the canvas. Blake Newton, no joke! 🙂 The desk is not normally that clean, either. But most of the time, I use Synergy. That lets me use the mouse/keyboard with my Ubuntu machine, but the mouse/keyboard can seamlessly work with Windows too. The net effect is a single desktop that just works without switching keyboard/mouse around. Read more about how I set up Synergy here: http://www.mattcutts.com/blog/how-to-configure-synergy-in-six-steps/ The description is for two monitors, but the left two Windows monitors are configured to look like a single desktop, so the net effect is that three monitors is no more complicated to control than two. Of course, you have to fiddle with Windows to get the two monitors configured in the first place, but that’s doable with some tinkering. Caleb, the mouse is a vertical mouse from Evoluent. If you work with computers daily or have any kind of carpal tunnel, I highly recommend a vertical mouse: http://www.evoluent.com/ I’ve used one for years. I’ve tried many other types of mice, and I won’t use anything but a vertical mouse now. I think Evoluent makes the best mice by far. “You do realize that the monitor might be the single most energy-consuming part of the PC setup, right?” Filip, I just changed most of the light bulbs in my house from incandescent to CFL, so I think I’m actually using fewer watts now than before. Dude, that idea’s freakin’ SWEET! By the way, Matt, I think we just picked out your next Hallowe’en costume. Hey Matt, I like the rig. I’m only working with two myself but I was thinking that if this were the old tube days you might be able to maintain a tan with that setup. Do u use Windows XP? 😛 Eheh! Yes now u have a 30″ but what do u think about fVWM or a Window Manager (http://xmonad.org/)? I am not a fan of MAC (sorry for those who like the appel) but isn’t this apparently simple desk “class” ? I have a similar setup but am thinking of trying that vertical mouse but want to know whether to get right-handed or left-handed version (I use left but only after retraining due to carpal stress in right hand). Will the VMouse actually alleviate pain from an existing injury? 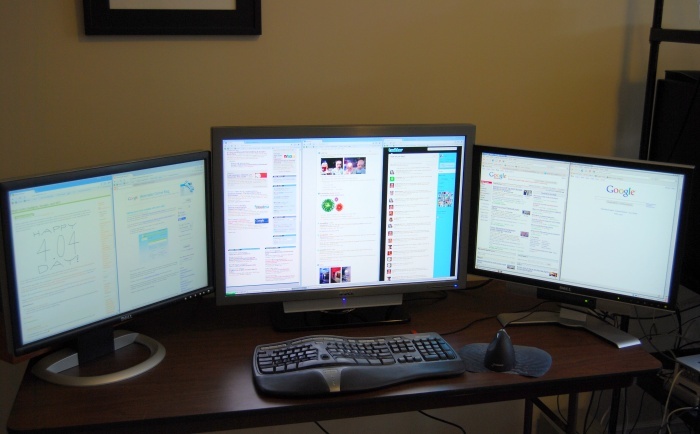 1 you should try orienting one of those screens *vertically*… this is great for code or long pages eg twitter where you scroll lots – plus will reduce the total width of the 3 monitors to fit within peripheral vision range. 2 Your keyboard placement looks like it requires reaching *up* slightly and/or leaning forward. I use a slide-out keyboard tray (mine’s from Ikea) to better position the keyboard over my lap/knees, a few inches lower. This leaves elbows naturally at sites and yields more erect posture. How Ubuntu is working with other software’s? Can we use that OS for an designing purpose? Like will use ADOBE products will it perform well? I am looking at 17″ form a desktop and a 15″ from my laptop, both running XP pro, but 30″?? That’s too large and closed for me. And by the way, my desk is very messy. I would love to have a GUI model for google search where i can query google search on one monitor and when i click on any search result it opens in the second monitor! I would certainly recommend turning those widescreens vertical, like mine. That way you dont need to manually manipulate the browser sizes so much. It’s far better, give it a try. Ah, the 30″ display. Love it! I have a MacBook Pro and a 30″ Apple Display. For one day it seemed big — now it’s just normal. It has been quite a while for you to add a new post in your blog? I think you have only posted 2 or 3 in April. May be you were busy. Matt, I was going to add another PC with 22” samsung 120 Hz LCD, [currently have a 19” LCD], but after seeing your setup and this post, I will review my decision about the 22” LCD. May be I will buy something like 26” + LCD. Your setup looks just like the one we see in Hollywood/movies where the hero use such setup to crack/hack things up. Nice set up Matt. Don’t you get overwhelmed with all those screens up and turning your head back and forth all day long!? But i cant complain that would be nice to have on my desk! Enjoy your new set up…looks pretty good. I have a 24″ iMac at home. Screen seems too tall. I lose track of the top and bottom of the screen sometimes. I’d think that’d be worse on your 30″. Have a 20″ iMac at the office and added a 2nd 20″ LCD (on the right side). Works better for me. No window to look out of! Not sure I could sit looking at three screens and a wall all day. Wow… how could you handle 3 pc on one time? hehehe by the way, I’m also planning to buy a 30″ screen. Good thing that you gave me idea what screen Im going to buy. So you are one of those guys who have not upgraded to Windows Vista. Do you plan to upgrade to Windows 7? I think, yes. Sticking too long with Windows XP means you are not ready to embrace new technology. Just kidding! Well, I’ve got a serious case of GES (Gear Envy Syndrome) – thanks for posting that picture! Dude, that mouse looks nuts, how do you navigate with that? I’m always amazed when I see folks with a crazy mouse. You should have spent a little on a desk upgrade, those fold-up desks aren’t so sturdy. Check out one of those all aluminum desks Lian-Li makes. Very nice desks, worth the extra. Other than that nice setup you have going there. Nice configuration. It is great you can have Ubuntu and Windows simultaneously, but I don’t know how you share the same keyboard for two operating systems :-0 … very interesting! This is a recession you know .. . No more fancy monitors! Great set-up! Since I started using my KVM switch for both my PC and Mac, I don’t think I could ever go back! The IO Gear one is great stuff! 3 screens! Guess you’re not a Greeny, then. i thought my 32 inch lkcd was big – well it only about one third. i am planning to upgrade to 40 inch monitor soon. Thanks for nothing, Matt! Our creative director just saw this, and I’m afraid she’s going to go on strike till she can have the same setup. It’s amusing reading the knocks about how you must not be “green.” Among all of the different people I follow online, you are, hands-down, the person who approaches every topic with the most clarity, careful reasoning and thorough analysis of the ramifications. Wellll, except maybe for the bit about that yogurt with the soaked rice on top. What was up with that?? I don’t think I’ve seen this question asked yet. Have you actually seen any pick-up in your productivity with this set up..ie Is it worth it? “Greeny” or “Green” means you care about environmental impact. How about 3 monitors at home? Imagine IF everyone did this? Also, how about his cat killing native wildlife? Most people *believe* they are “green”, until they will miss-out or they are put-out. On the topic of “Global Warming” I doubt Humans have kept Global weather records for anywhere near long enough to say whether the Planet is warming, cooling or basically static. I believe the Earth will always be dynamic in regards to Climate and will survive for a whole lot longer than Humans. The day Humans are extinct is the say ALL other life on Earth will recover and thrive without harming the Planet. We Humans are the most selfish and damaging life to ever live on Earth, the sooner we make ourselves extinct, the better. Matt, say I wanted to switch things up a gear and give you another window to view something you may not have considered that wasn’t via webmaster tools. How might I do that? Hey Matt, nice set up! But you know what they say… No one can really multi-task, keep distractions at a bare minimum, etc. – How do you ‘get things done’ in spite of all those news, tweets and updates continually changing in front of you? I tend to think one should prefer a nice, single display and use tabs over a multi-display set up. How could you reduce distractions this way? I’ve got an overview of mine and links to yours and Dannys. Submissions welcome. It’s cool to see how we all work at the desktop level. Very nice set-up. Thanks for the heads-up on the mouse, investing in one as we speak. Eric Ward had a great idea due to the fact that I was always curious what others set-ups were like. Thanks for the info gentlemen! ← Ubuntu 9.04 boots in 7.83 seconds!